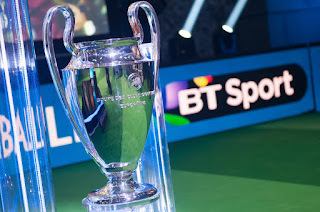 It's the turn of Manchester's two main football teams to feature on BT's Freeview channel, as Manchester City and United compete in the next round of the Champions and Europa League. On Wednesday 19th October, Manchester City face Barcelona in the Champions League. BT Showcase will have coverage on Freeview channel 59 from 7pm, kick-off 7:45pm. Current BT Sport subscribers have access to a better quality stream via the usual BT Sport online service / mobile apps. Then, on Thursday 20th October, Manchester United play in the Europa League. Their match against Fenerbahçe kicks-off at 8:05pm, with coverage on Freeview channel 59 from 7:30pm. Coverage is in standard definition. HD coverage is only available for BT Sport HD subscribers via Sky, BT/Plusnet TV or Virgin Media. Virgin Media viewers can catch the free coverage on channels 100 and 548, according to BT.